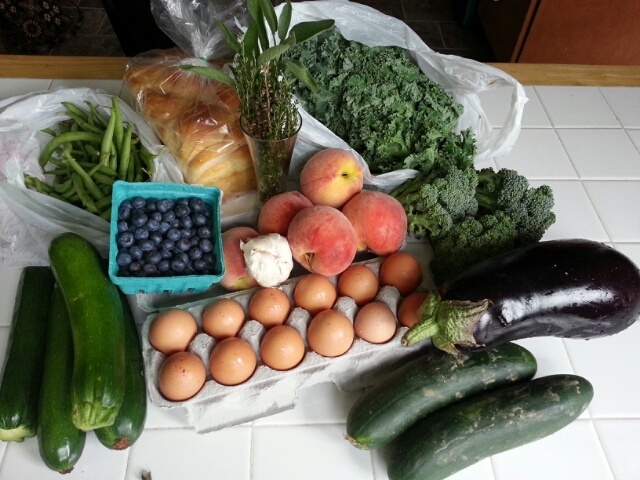 Last week (week 7) in the CSA: zucchini, cucumber, peaches, corn, plums, garlic, blueberries, potatoes, eggs, and bread (Breadery Grains Galore). There should have been kohlrabi as well, but I swapped for more potatoes. Fast forward a week and the zucchini and cucumber are still uneaten. I boiled the corn the very first night (fresh corn is the best; it dries out if you leave it in the fridge for too long) and it was fantastic. (Well, except for the one ear I got which hadn’t quite developed all of its kernels. Them’s the risks.) 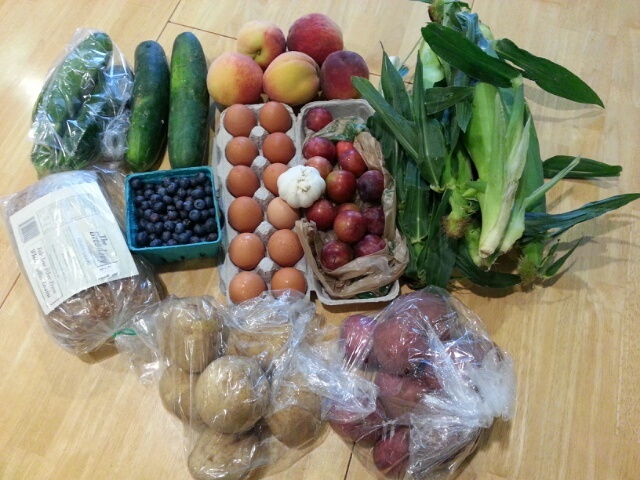 Peaches, plums, and blueberries disappeared in fairly short order as well. We boiled up the potatoes with some onion and Old Bay, to go with steamed crabs this weekend. I’m reading over the previous CSA post and… I think the kale is still in the fridge too, actually. It’s probably still fine; kale is a hardy vegetable and I washed the leaves and packed them in paper towels, which is a great way to keep leafy greens for longer. Still, need to get to that. Back to kale. Kale possibilities are endless. I usually like to saute blanched kale in bacon grease with garlic and onions, or cook it into a soup (ideally with beans and sausage), or bake it into chips. The weather being what it is, though, I think it’s actually an ideal time to enjoy a massaged kale salad. There are even some mangos in the fridge. CSA week 6: peaches! and other stuff. I am eating a peach right now and it tastes like heaven. I always resented summer (heat, humidity, chokingly stuffy cars) but now I have a reason to celebrate it: these sweet, ripe, beautiful local peaches. This is not a freestone peach, so it’s messy; the flesh is sticking to the pit in clumps and strands, and everything is getting stuck in my teeth. Also, my cubemate is doing a valiant job of ignoring the slurps and smacking sounds I’m making as I try not to let a single drop of juice escape to run down my arm. Peaches are not a graceful fruit to eat. But a fresh, summer-ripe peach is totally worth the inevitable assault on your dignity. Mmm, peaches. I’m going to be haunting the farmer’s market for these. The cucumbers will probably get pickled with the cucumbers from last week’s pickup, since I hadn’t gotten around to that. And the peaches and blueberries will take care of themselves. As for the eggplant, no concrete plans yet. The eggplant possibilities are endless. We might grill it, if we fire up the grill this weekend (and if so that’s likely where the zucchini will get cooked too), or we could roast it for baba ghannouj (in which case the kale will get cooked then as well), or maybe I’ll try one of those crazy recipes from the Ottolenghi cookbook that we got for Christmas. The world is my oyster! Or my eggplant, anyway. CSA membership doesn’t take any special amount of creativity; it just takes commitment. Cook, preserve, or freeze, it doesn’t matter. Just get the pickup out of the way; next week is coming, ready or not. 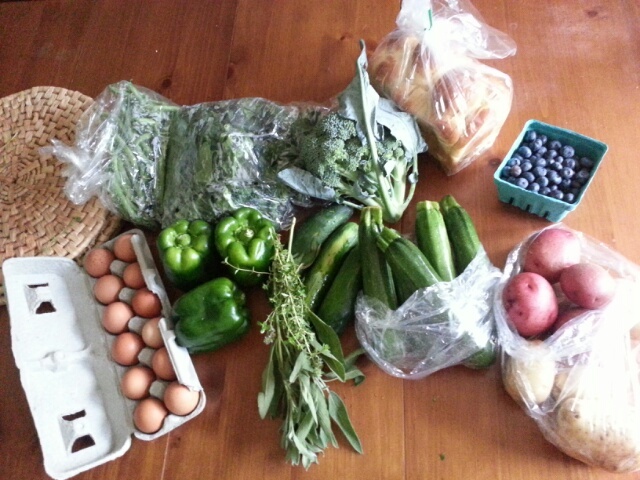 Summer CSA week 5: green beans, spinach, broccoli, green peppers, cucumbers, zucchini, red and white potatoes, blueberries, eggs, and bread (Great Harvest challah). I also picked up a handful of thyme and sage. What we’ve cooked so far from the pickup: absolutely nothing! We had a long Independence Day weekend but we ended up just having cookouts and going to other peoples’ houses. We have a lot of grilled meats left over though so my plan is to just cook all the CSA items up separately (well, definitely the beans, spinach, zucchini, and broccoli) so that we have it available for sides for the meats. The cucumbers will probably get pickled, and the peppers and potatoes will be frozen for later (thanks to the Unmanly Chef, I know how to freeze root vegetables! My world will never be the same). As for the blueberries, what we didn’t eat right away has been portioned off for the kid to take to daycare in his lunch. I’m sure he’ll be delighted. …and a cream cheese frosting, fairly standard: 1/2 block of cream cheese creamed with 1/2 stick of butter, then mixed with 2 cups powdered sugar and a dash of vanilla until smooth. Honestly the most annoying part was grating the carrots; we grated one and a half carrots by hand until I finally figured out where we’d stashed the grating disk for the food processor. Man, I love technology. Once we had the food processor fired up, I think it took less time to grate all of the remaining carrots and wash the resulting dishes than it would have to grate the rest of the carrots by hand. I also toasted coconut flakes in the last 5 minutes of cooking, to have coconut to sprinkle over the top. I set up my decorating station so that any mess I made would be contained on top of a baking mat. Those things are so easy to clean. 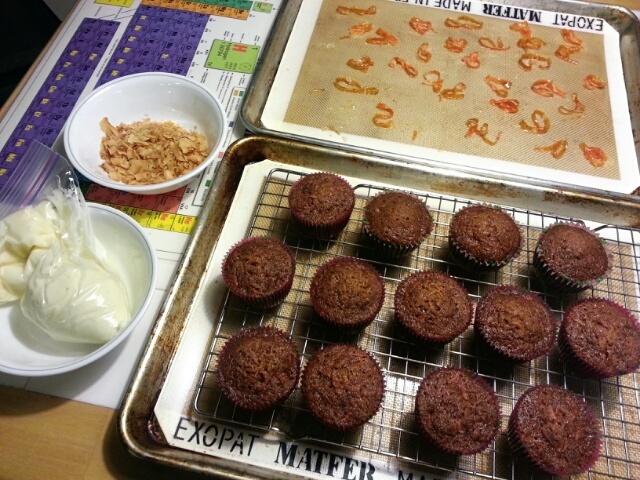 That was when I found out that a plain old cupcake, no matter how badly it’s frosted, will look amazing when you have candied carrot strips and bits of coconut to sprinkle over the top. They were phenomenal, by the way. 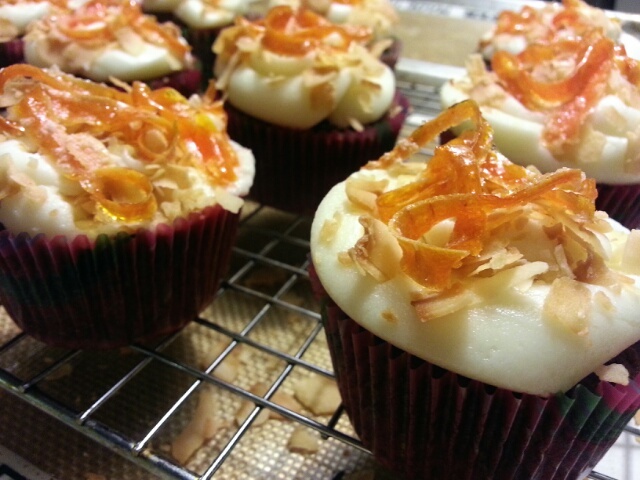 The cupcake recipe makes an almost magically moist and airy cake, and the rich cream cheese frosting, punctuated by toasted coconut and crunchy candied carrot, is a perfect accompaniment. And K liked it, which is really all that matters. Happy birthday, K!